Ground controllers are running Europe’s ExoMars orbiter through a post-launch checkup a week after its successful liftoff aboard a Proton rocket, and a first look at the probe’s systems revealed no problems, the mission’s flight director said Tuesday. The ExoMars Trace Gas Orbiter and Schiaparelli lander are due to arrive at Mars on Oct. 19, the first European Space Agency mission to the red planet since 2003. 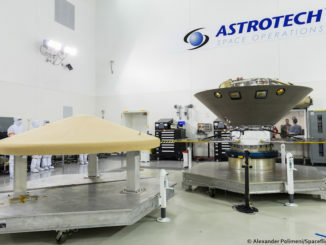 The craft are making the interplanetary cruise as one, making the combined probe one of the largest ever sent to Mars. The orbiter carries sensors to detect gases in the Martian atmosphere such as methane, which could be a telltale sign of microbial life or previously unseen geologic activity involving liquid water. It also has a mapping camera to survey the planet’s landscape and an instrument to search for water hiding in Mars’ crust. The lander’s primary goal is technological: demonstrating Europe’s ability to successfully put a spacecraft on Mars. Schiaparelli will only last a few days after touchdown, but it should beam back images from its descent and weather reports from the surface. Spaceflight Now members can read a transcript of our full interview with Michel Denis. Become a member today and support our coverage. 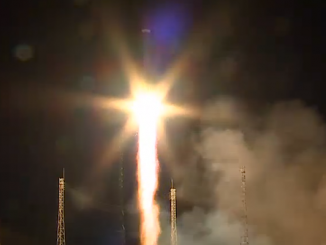 The mission blasted off March 14 on top of a Russian Proton rocket from the Baikonur Cosmodrome in Kazakhstan. The Proton booster’s Breeze M upper stage deployed the ExoMars spacecraft nearly 11 hours after launch, following a set of four maneuvers to guide the Mars probe away from Earth. The launch was right on target, Denis said Tuesday. “From the information we obtained from tracking, the error from injection was 1.5 meters per second (3.4 mph), so extremely small,” Denis said. The Proton/Breeze M accelerated the 4,335-kilogram (9,557-pound) spacecraft to a velocity of 33,001 kilometers per hour (20,505 mph) relative to Earth, according to ESA. An apparent explosion of the Breeze M upper stage after it parted ways from the ExoMars should have no impact on the spacecraft, according to Denis. A report published on the website of Popular Mechanics magazine indicated the Breeze M stage apparently broke apart after releasing ExoMars. The upper stage, which burns a mixture of hydrazine and nitrogen tetroxide propellants, was supposed to ignite its main engine after the separation of the ExoMars orbiter to veer on a different trajectory from the Mars-bound spacecraft. Imagery obtained late March 14 from OASI Observatory in Brazil, and released by ESA three days later, appears to show at least nine fragments from the Breeze M rocket stage speeding through space. While ESA initially said the ExoMars Trace Gas Orbiter appeared in the imagery, officials on Wednesday updated the caption to the animated image posted above. The Breeze M should have been in two pieces after the launch — the rocket stage’s main body and a detachable fuel tank. Denis told Spaceflight Now that ExoMars managers in Europe have received no information on the potential explosion from Russian launch authorities. 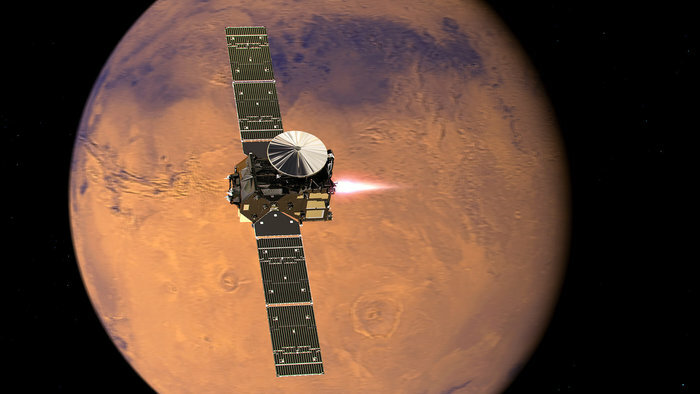 Popular Mechanics reported the ExoMars orbiter could have been damaged by the explosion, and further checks of the craft’s science instruments are needed to ensure the probe has no ill effects from the anomaly. While the ExoMars spacecraft and the Breeze M were still relatively close, the distance was large enough to ensure there is “no risk at all” to the Mars mission, Denis said. Engineers at the ExoMars control center in Germany finished an initial round of activation and tests of the Mars-bound spacecraft March 17. The next day, controllers commenced with commissioning — a set of thorough systems checks — to verify the probe is fully functional. The orbiter’s 2.2-meter (7.2-foot) steerable high-gain antenna has been deployed and pointed along each axis, Denis said. Critical activities still to come include the switch-on of the Trace Gas Orbiter’s four science instruments beginning April 4. A U.S.-built Electra radio provided by NASA will be turned on April 1 to check its health. The Electra radio will relay commands and scientific data between Earth and landers on the surface of Mars, such as Schiaparelli, the Curiosity and Opportunity rovers, and future robots in development by NASA and Europe. The telecom relay is a faster way to transfer information than via a direct link. Commissioning of the Schiaparelli landing craft should begin April 8, Denis said. The lander briefly turned on shortly after last week’s launch, confirming it survived the rumbling blastoff. Another key test still ahead for ExoMars is the first firing of the orbiter’s main engine July 18. That will be followed by a major mid-course correction maneuver July 28 to bend the craft’s trajectory toward Mars. The orbiter’s smaller rocket thrusters have all passed their post-launch tests. “We have tested all the thrusters — all the little engines — one by one such that all thrusters and all redundant thrusters are known to function properly,” Denis said in a phone interview. Smaller correction burns are planned in August, September and in the weeks before arrival at Mars to use the orbiter to precisely aim the Schiaparelli lander toward its touchdown target in Meridiani Planum, a flat plain near the Martian equator. That leads up to separation of Schiaparelli from the Trace Gas Orbiter on Oct. 16, followed 12 hours later by another maneuver to put the orbiter on a path to miss Mars. 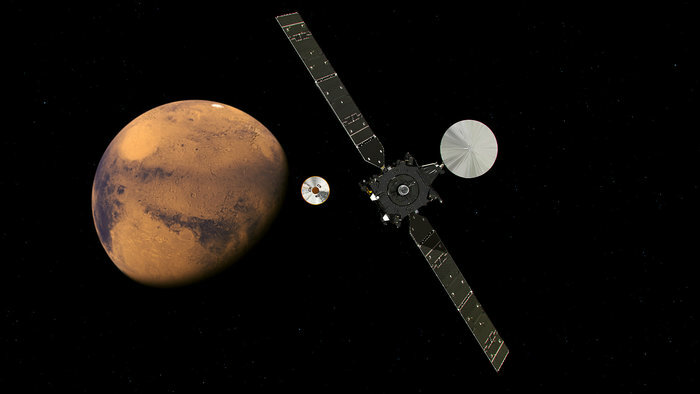 The make-or-break engine burn to put the ExoMars mothership in orbit will last more than two hours, during which the Schiaparelli probe will plunge into the atmosphere and engage a supersonic parachute, braking rockets and a novel crushable carbon fiber shield to make a safe landing. The simultaneous orbit insertion and landing operations require careful planning by the team led by Denis. Controllers are already rehearsing how they will handle the workload. But when arrival day comes, the ground team will only be able to monitor the critical maneuvers. The events are so quickly paced, and the distance between Earth and Mars so great, that engineers will be unable to intervene. It will take nearly 10 minutes for radio signals to travel from Earth to ExoMars on Oct. 19. With the spacecraft now taking aim on Mars, the only minor problem detected since the launch was an unexpected temperature rise inside the orbiter’s main engine. Engineers from ESA and Thales Alenia Space, the craft’s prime contractor, decided to change the orbiter’s orientation in space by a few degrees to avoid pointing the engine directly toward the sun. The adjustment resolved the issue. 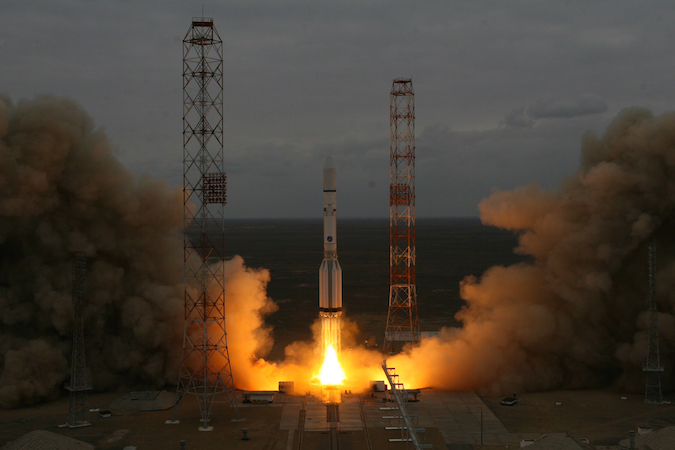 “It’s obvious that the European industry who built ExoMars has done an excellent job,” Denis said.